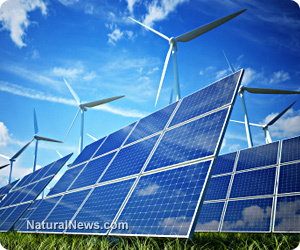 (Natural News) In a Stanford News article, researchers have invented a cheap water-based battery. If successful, a much bigger version will serve solar and wind farms, storing excess electricity for later redistribution in the power grid. The three-inch tall prototype stores enough power for a small LED flashlight. The researchers believe they can scale up this initial design to meet industrial requirements. Stanford University (Stanford) professor Yi Cui served as the senior author of the research paper. He says the manganese-hydrogen battery can reduce the U.S. reliance on dirty yet reliable fossil fuels to supplement clean but erratic solar and wind energy. Cui’s postdoctoral student, Wei Chen, came up with the idea for the water-based battery. The researchers used manganese sulfate, an industrial salt that is used in dry cell batteries and other common products. In their experiment, they reported that electrons reacted with the manganese sulfate to create manganese dioxide on the electrodes. The excess electrons bubbled off as hydrogen gas, which could be collected, stored, and burned as clean fuel. The researchers also demonstrated how the water-based manganese-hydrogen battery could be recharged. By sending an electrical current through the electrodes, they could turn the manganese dioxide back into manganese sulfate. Once the salt was replenished, the extra electrons would again bubble off as hydrogen gas. This hydrogen production cycle could be repeated multiple times. Researcher Cui estimated that the cost of storing 12 hours worth of charge for a 100-watt lightbulb amounted to a penny. He based this on the predicted lifespan of the water-based battery. The Department of Energy (DOE) requires grid-scale batteries to store and discharge a minimum of 20 kilowatts of power over an hour. Such energy storage systems must also be capable of recharging at least 5,000 times and last for 10 years or more. Furthermore, the cost of the battery cannot exceed $2,000, which translates to $100 per kilowatt hour. Fossil fuel accounts for 70 percent of U.S. electricity. Coal and natural gas plants also produce 40 percent of the country’s carbon dioxide emissions. However, while solar and wind power are cleaner, they are also not always available. Solar only works during the day, and there are windless days. Furthermore, the power grid experiences surges and drops in demand depending on the situation. People will turn on the air conditioning during hot days and the heaters during freezing nights. To meet this peak demand, utilities must boost power generation on the double. Otherwise, brownouts and blackouts might bring down the whole grid. Most utilities use fossil fuel power plants that are only fired up when needed. Other power companies use pumped hydroelectric storage, where extra energy is used to pump water back into the reservoir for additional power during peak demand. High-capacity batteries are intended to serve in this same role for solar and wind energy. They can store excess power during low demand and release it as needed. Current rechargeable battery technologies have not yet proven their viability for grid-scale power storage. Lithium ion batteries, for instance, use costly rare earths. Cui believes the manganese-hydrogen process is a potential winner because it costs much less than existing technologies. While the prototype uses expensive platinum in the electrode, Chen’s team has found alternative catalysts that could meet the DOE cost requirements. Interested in other power storage technologies? Head over to Power.news to learn more.